Last April 2011, my husband brought me a liquor filled chocolate as pasalubong - A chocolate filled with Jack Daniels whiskey by Goldkenn. He bought this at one of those duty free shops either in Kenya or Hongkong or Dubai. He knows that I am fond of dark chocolates (not so much of milk chocolates though) but I never mentioned to him that I love chocolates with liquors hehehe. Anyway, Jack Daniel’s Chocolate is made from Goldkenn’s premium swiss milk chocolate that is filled with Jack Daniel´s Tennessee Whiskey . This chocolate bar is wrapped in a gold foil with all four corners sealed. It is cased in a cardboard box that comes with the Jack Daniel’s Logo. The box is the exact replica of the Jack Daniel’s whiskey bottle label. 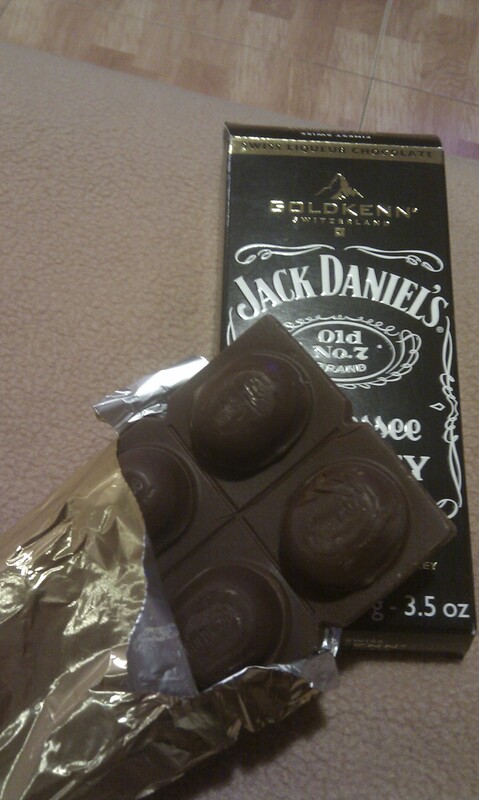 I actually thought that the chocolate is manufactured by Jack Daniel’s not until I saw the small emblem of Goldkenn. I just wish I can find a Belcolade retailer here in Singapore.